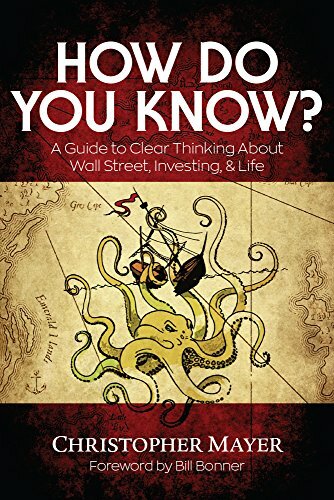 To Invest With Integrity (or The Memoirs of a One Legged Investor): Book Review: How Do You Know? Book Review: How Do You Know? One of the four principles of value investing espoused by Li Lu (link here) is to understand and identify one's circle of competence. To do that, the first basic questions are likely to be What Do I Know? and How Do I Know? This is where Chris Mayer's book comes in handy. This is not a spoiler. The basic premise in Chris' book is that we don't really know much at all. Realising that we don't really know much at all (actually being convinced and internalising this reality, instead of paying lip service to it) could actually be the dawn of real wisdom. For me personally, this book has helped me reconcile conflicts and issues in respect of religions (short answer: degrees of belief, reasonably based) which is just a short hop away from issues in investments (short answer: degrees of conviction, reasonably based). The need for a margin of safety in investments is brought into stark relief when one considers the vexed issue of cause and effect. A background knowledge and reading of Nicholas Taleb's books would assist the reader here. I have previously caused some controversies in a previous book review. It is not my intention to cause offense again to honest and good work done by others. I do this in the spirit of intellectual inquiry for the betterment of all involved, and I hope my following comments will be interpreted as such. The pitfalls of data mining and survivorship bias are clearly demonstrated in Chris Mayer's book (Chapter 2) where he wrote about subsequent studies on the "great" companies covered by the authors of bestsellers In Search of Excellence (Peters and Waterman) and Good to Great (Collins and Porras). The efforts of the authors of Intelligent Fanatics should be read in conjunction with the above and also with this excellent article from the Scientific American published recently in March 2018. A very basic summary of some tentative scientific research shows that whilst talent is important, luck plays a large role in success.